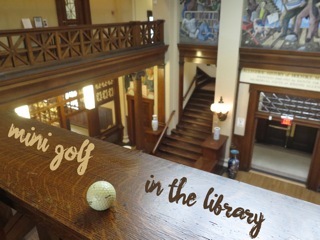 Mini Golf in the Library! is a fundraiser for the Holyoke Public Library. Major funding comes from local businesses and donors that sponsor "holes" on the golf course or choose other ways to underwrite the event. Funds raised through ticket sales and sponsorships (and an auction during the cocktail party) help enhance library programming and services, especially for teens and children. 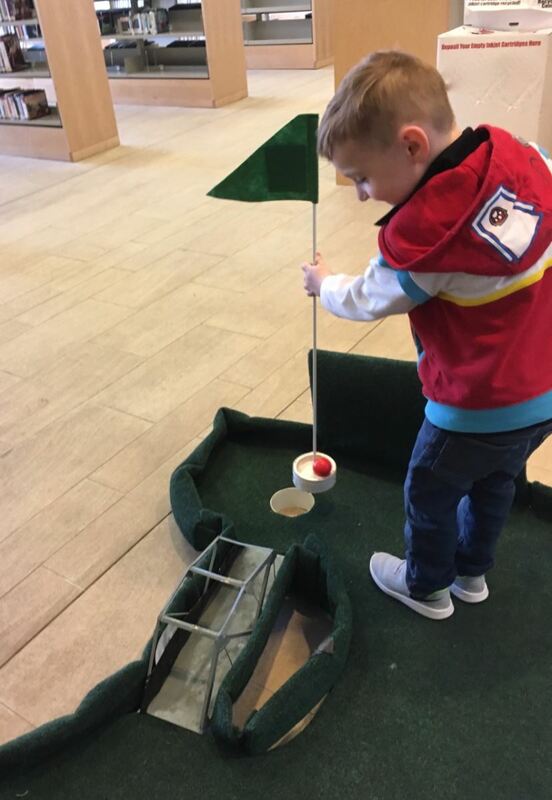 Our first Mini Golf event (April 2016) was a big success: people of all ages enjoyed playing 18 holes of miniature golf inside the library, and the event raised over $6K. This wonderful community event has now become an Annual FUN raiser and Fundraiser. See the 2016 photo album; 2017 photos; and the 2018 photos. Mini Golf in the Library! 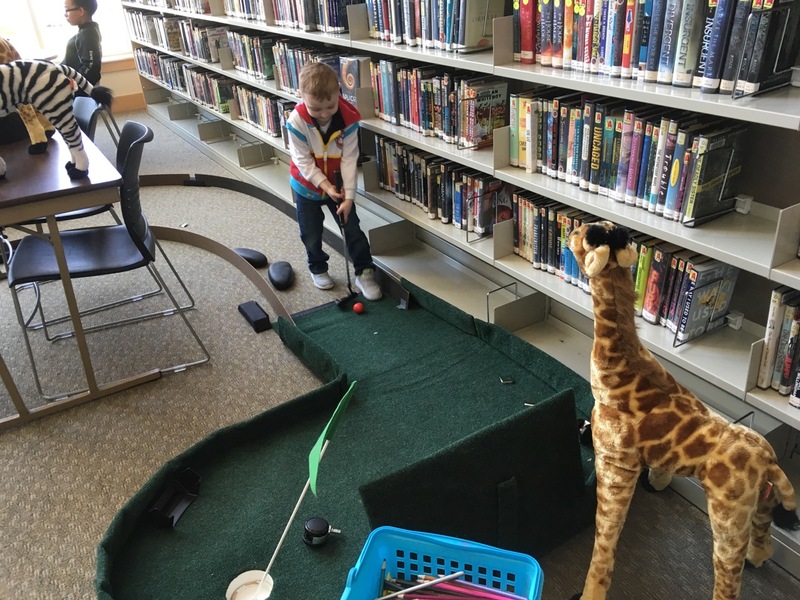 ¡Minigolf en la Biblioteca! Family-friendly. $5 to play. All ages welcome. Discount rate for youth ($3 for ages 5-12; under 5 free). Food will be available for purchase from La Mesa Food Truck. 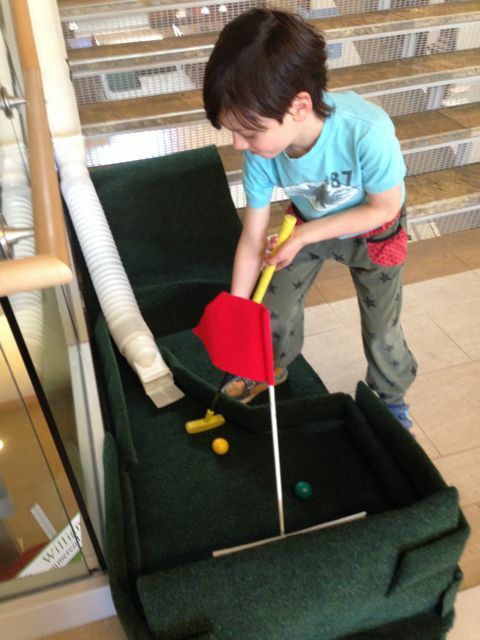 Come play miniature golf inside the Holyoke Public Library! 18 holes! The first four tees and putting greens are on the top floor (Level 4) in and around the Non-fiction stacks and Reference stacks. Play continues down the stairs and throughout the Children's Room on Level 2, then down to the Fiction Stacks, Level 1, and the Teen Room on the ground level. Holyoke Public Library services remain open during the usual Saturday hours (8:30 am-4 pm). Certain areas (for instance, the Computer Room) are undisturbed by the golf course. VOLUNTEERS are welcome. We'll need many volunteers on April 6. The time slots and tasks are described on SignUp.com : http://signup.com/go/YFfYzBW Or you may email friendsofthehpl@gmail.com to volunteer; we could use help in the coming weeks, too. We thank the SPONSORS of Mini Golf in the Library! 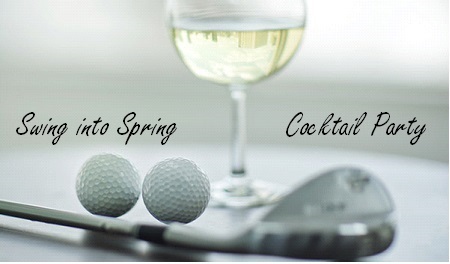 Event Sponsors and Hole Sponsors make this wonderful event possible. We also thank our DONORS, who contribute auction items, in-kind services, and prizes. Homewood Suites by Hilton – complimentary lodging for Mr. Bolton of Library Mini Golf, who brings us the equipment and supervises set-up of the 18-hole course. Tower Square Hotel – a gift certificate valued at $200. Holyoke Fire Dept – a ride on a Fire Truck!